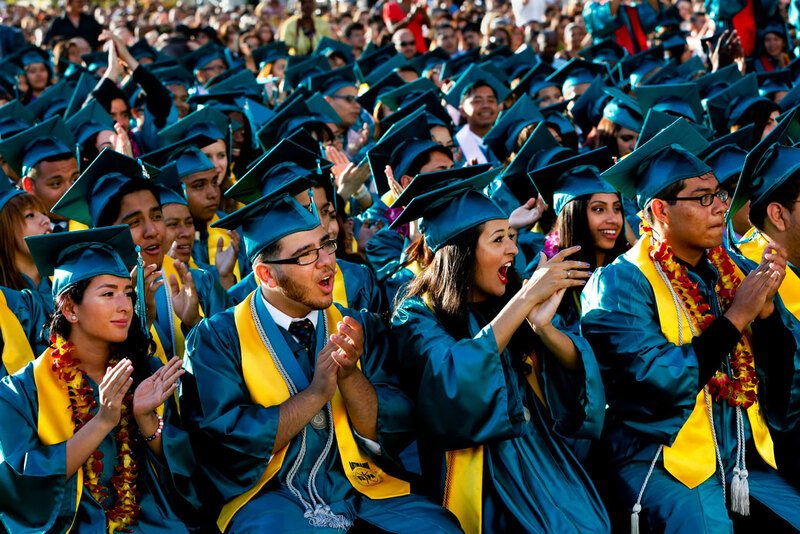 High school graduates cheer during a commencement speech given in Grand Avenue Park in Los Angeles, May 30, 2013. A 50-state review of high school graduation requirements shows misalignment between the coursework necessary to receive a high school diploma and to be eligible for college admissions. A high school education should ensure students are eligible for their chosen pathway of what comes next: college and careers, as well as civic life. Put simply, high school coursework requirements for a basic, nonadvanced high school diploma matter because they create, or stifle, what is possible for students as they progress through and beyond high school. To date, the education reform debate has rightfully focused on standards, defining what students should know and be able to do, ensuring that expectations are high for all students and are aligned with college academic standards. At the same time, the politicization and polarization of the Common Core State Standards dominated the debate. Little of substance about coursework requirements, which is another important aspect of academic expectations, received any attention in the education reform discussion, save the media attention on graduation rate scandals. However, rigorous academic standards mean little if students do not have to take courses that are aligned with standards’ full breadth. The authors reviewed high school coursework requirements for each state, including Washington, D.C., and Puerto Rico, and uncovered major problems with the expectations states set to receive a basic, nonadvanced high school diploma. First, most of these requirements fail to meet the admissions criteria for states’ respective public university systems. Second, these requirements leave many decisions up to students, such as which math courses to take to fulfill coursework requirements; without sufficient preparation or guidance counseling, students may take courses that are misaligned with their postsecondary aspirations. And third, without sufficient resources to ensure that all students can meet rigorous coursework requirements, problems such as tracking students into less rigorous courses and using nefarious practices to get students across the graduation finish line will persist. To understand the extent to which diploma requirements denote eligibility for a student’s chosen postsecondary pathway of choice, this report analyzes state high school graduation requirements for a basic, nonadvanced high school diploma. The authors organize their analysis into three main areas: years of study required by subject matter for high school graduation and state college admission; course type and sequence required by subject matter for high school graduation and state college admission; and how high school graduation requirements stack up against measures of quality. Are high school graduation requirements for a standard, nonadvanced diploma aligned with requirements for admission to the state’s public university system? Answering these questions provides policymakers, educators, parents, and students with information about whether the high school diploma a student receives denotes eligibility for their postsecondary pathway of choice: admission to a state’s four-year public university system; further study in a career and technical education (CTE) field; or direct entry into a career or the military. Ideally, the answers should be “yes” to both questions in every state. Rigorous expectations for a high school diploma are a critical first step to preparing all students for success after graduation. However, these rigorous expectations must be matched with rigorous systems of support—including excellent teachers, effective curricula and instructional materials, access to challenging coursework, and other key resources—to ensure that students in fact meet these expectations and are not artificially promoted through the high school diploma granting process. In almost every state for at least one subject, there is a preparation gap that necessitates students seeking admission to the state public four-year university system to take additional coursework that is not required for a standard high school diploma. What’s more, this additional coursework may or may not be offered on the high school campus. For example, according to the Civil Rights Data Collection (CRDC) by the U.S. Department of Education, 1 in 10 high schools do not offer Algebra I, and 2 in 10 do not offer Algebra II—courses that are critical to success in college.3 Students in high-income schools and districts with sufficient college counseling and resources to seek this additional coursework may have an easier time addressing these disparities than students in low-income areas, reflecting inequity in the availability of educational resources. The preparation gap can have significant impacts, especially on under-resourced student populations. Nationwide, there is one college counselor for every 491 students, but in low-income schools and schools with high percentages of students of color, the ratio can be as high as one counselor for 1,000 students.4 At this rate, students—particularly low-income students and students of color—are far more likely to have insufficient support in helping them navigate the differences between high school graduation requirements and college entrance requirements. The preparation gap can also have implications on student readiness for college-level coursework. Research shows that students graduating with a state’s standard high school diploma need remedial coursework at higher rates than those with the advanced diploma, and lower rates of students overall seek the advanced pathway.5 Unfortunately, the college remediation rates by high school diploma types remain a mystery nationwide, as states must only report the graduation rate for the diploma awarded to the majority of students. Students need support in identifying what coursework will satisfy both high school diploma and college admission requirements. High school diploma requirements are often not straightforward, offering students multiple options to fulfill requirements, most usually in math, science, social studies, and foreign language, whereas colleges are usually more specific about the coursework required. This lack of specificity in high school requirements means that without sufficient support from guidance counselors or tech-based solutions, such as virtual college counseling, students may be unaware that they are not truly prepared for college. Students may also find themselves ill-prepared for life after high school for reasons other than academic coursework that is not aligned with state public university entrance requirements. This analysis compares high school graduation requirements for a state’s standard diploma with a quality rubric, which includes known college- and career-readiness benchmarks, such as a 15-credit college readiness high school course sequence and at least three courses in the same CTE field. 6 The rubric also includes elements of a well-rounded education.7 Again, only a handful of states meet any of these quality benchmarks—and no state meets them all. One promising approach to address the alignment and quality concerns is competency-based graduation requirements. Instead of measuring how many credits students take in specific subjects, competency-based requirements require students to demonstrate mastery of academic knowledge through assessments or other means. But this approach is still in the early stages, and it is not yet known how well it will work to address the quality of learning. That being the case, this analysis does not focus on the competency-based approach. Ultimately, this analysis finds that students can graduate high school having done well in their courses, but still might not have met the requirements to enroll in college because of the problem of misalignment. Additionally, because state high school graduation requirements do not meet the full range of quality standards—college readiness, career readiness, and a well-rounded education—even if the requirements are aligned to college entrance requirements, students might not be truly prepared for the next step. Ensure clear alignment of the requirements for high school graduation with the admissions requirements for the state’s public university system. Offer an additional “career-readiness diploma” for students that choose not to attend a four-year university. Publish the graduation rates disaggregated by student group and diploma type. Ensure that all districts have the resources and educator workforce to offer the courses and preparation needed for students to meet the requirements for both standard and career-readiness diplomas, especially in math, science, and foreign language. If the goal is to do more than business as usual in education, a thoughtful approach must be taken to the question of how best to ensure that all students are prepared for work and life after high school. Put simply, a high school diploma ought to be a ticket to success—not a worthless credential. In the United States, a high school diploma represents the satisfactory completion of education from kindergarten through 12th grade. The diploma typically represents the completion of coursework for grades nine through 12 in math, reading, social studies, science, and a range of elective subjects such as fine arts and physical education. A high school diploma can also, but less frequently, represent the completion of specific tests, so-called capstone—or culminating projects, internships, and other work required to complete high school. It is important to emphasize that this rate represents the achievement of very different requirements from one state to the next, as graduation requirements are set by each state and are sometimes even determined by the district.12 As a result, the amount and type of coursework and extracurricular activities vary by state. The amount of study required in each high-school subject to result in the receipt of a standard diploma should meet or exceed what is required for admission to public state university systems. Since every state public university system in the United States requires a diploma from an accredited high school, having academic alignment between these systems would send a consistent signal about what it means to be college-ready. The next section of this report analyzes the amount and type of coursework and extracurricular activities needed to graduate high school with a standard high school diploma, compared with what is required for entry to the state university.13 The analysis is followed by an assessment of the quality of the requirements against benchmarks of college readiness, career readiness, and a well-rounded education. For this report, the authors only reviewed state-level high school coursework requirements needed to receive a basic, nonadvanced high school diploma. In some states, these may be the sole requirements that exist, while in others, these may be in addition to what the local school district requires. Additionally, states may have more than one pathway to the nonadvanced diploma—one for the general student population and another for students with disabilities who may need modifications in the coursework requirements. This analysis excludes the latter. Each state administers a public university system, usually with more than one campus. The authors selected a single public, four-year university located in a major urban center in states with multiple campuses. This analysis also does not address subject-specific study pathways, a practice that includes enrolling students in specific subjects that are aligned and relevant to their chosen program of study and career goals. Finally, the District of Columbia and Puerto Rico are considered states, bringing the total potential number of states to be included in this analysis to 52, though for reasons described in the methods for the amount of course study and course type analysis, several states are excluded. Coursework requirements for both high school graduation and college admissions fall into two areas: years of study required and type of coursework, or course sequence. This section focuses on years of study. The analysis for this report reviews the amount of course study required to receive a state’s basic high school diploma, called the “default diploma” in a recent analysis.14 As a result, this analysis excludes consideration of advanced or other diploma options that students can opt into. These requirements are reviewed against a state’s public university system admissions criteria for academic coursework in the following subjects: math, English, science, social studies, foreign language, fine arts, physical education/health and electives. The authors organize results into three categories: less than, meets, and exceeds college expectations. Course study amounts to less than college expectations when high schools require any less number of coursework units in a particular academic subject. Amount of high school course study meets college expectations when both systems require the same number of units in each subject. Course study requirements in high school exceed college expectations when they require any more number of coursework units in a subject. To calculate the amount of study required, the authors used Carnegie units. One Carnegie unit equals 120 hours of class time over the course of a year. Most states already use this method, so no conversion was required. Any states not using Carnegie units were converted to the Carnegie method for this analysis. Such states used a different numbering system to refer to 120 hours of class time, for example, 2 units to represent 120 hours rather than 1 or 10 units rather than 1. The years of study analysis includes all states except the following: Colorado, Maine, Massachusetts, and Pennsylvania.15 These states require demonstration of mastery in lieu of specific coursework unit requirements. New Hampshire students are required to demonstrate mastery of specific academic subjects and courses in order to be awarded credit; for this reason, this state is included in this analysis.16 The total number of states included in this portion of the analysis is 48. While both the high school and college systems use Carnegie units to measure learning time, the number of units required varies by subject for each system. Each state received its state data compiled for this report to review for accuracy. The following states either provided direct feedback or documentation of the state’s high school graduation requirements: Alaska, Arizona, Colorado, Florida, Georgia, Idaho, Illinois, Kentucky, Maryland, Massachusetts, Montana, Nebraska, Nevada, New Jersey, New York, Pennsylvania, South Dakota, Tennessee, Texas, Utah, Washington, D.C., Washington state, and Wisconsin. Years of study captures how much study students must complete in a school subject area. Although high school from entry through graduation is typically a four-year process, students do not always have to complete four years of study in every subject to graduate. To be sure, this metric alone does not measure academic readiness because it does not account for content mastery. This is especially true when students complete courses with low grades or the academic standards on which the courses are based are not rigorous. This analysis acknowledges that completing required units of study is just one aspect of academic learning, although it is one of the primary measures of academic attainment used by the broader U.S. public education system. Table 1 provides an overview of the number of years of study required for math, English, science, social studies, foreign language, physical education, and electives to earn a basic high school diploma. Across each category of comparison—less than, meets, exceeds college expectations—select high-level results follow. There is the least alignment for the number of units required in the foreign language subject area. Almost half of states require less than college expectations when it comes to the foreign language requirement, usually two years of study. In math, while a large majority of states meet or exceed college expectations, still nearly 1 in 5 states require less than college expectations. It is important to note that while there seems to be a high degree of alignment in the years of study for science, there is potentially a high degree of misalignment in course type, which is further explained in the course type analysis. There is most agreement in the units required for English, where 44 states meet college expectations, usually four years of study. Finally, a majority of states exceed expectations for physical education units. Within each subject, the results are as follows for unit count alignment between high school and state college organized by the following categories: less than, meets, and exceeds college expectations. Table 2 provides a comparison of high school graduation and state four-year public university coursework admissions requirements in math, English, science, social studies, foreign language, physical education (PE), art, and electives. The number of units of high school math required to earn a diploma in 29 states meet college expectations. Nineteen of these states require three years of math for both the high school and public university systems; the remainder require four years. Of course, the types of math courses and the sequence in which those courses are taken matters in high school graduation and college admissions. The course type analysis below discusses these specifics. Table 2 shows that one state—California—fails to meet college expectation in years of study in English. California’s public university system requires four years of English but to receive a high school diploma, the state requires only three years. Forty-four states meet expectations in years of English study. For these states, both the public university and high school systems require four years of English. Finally, three states exceed college expectations in years of study of English: Alaska, Puerto Rico, and Washington, D.C., again because these public university systems set no specific coursework requirements. According to Table 2, four states require less than the number of units required of science for high school graduation than for college admissions. These four states require one full year less of science to receive a high school diploma than is required for their respective public university system admissions. Thirty-four states meet expectations of number of years of study in high school science for both systems. Most of these states require three years of study for both the public university and high school systems. A handful of states require two or four years for both systems. Ten states exceed expectations in the number of years of study of high school science. Most of these states require one more year of science to receive a high school diploma than needed to qualify for public university admissions. The public university systems in Alaska and Washington, D.C., set no specific coursework requirements, so their high school systems automatically exceed expectations. Importantly, science requirements span three component parts: years of study, subject, and course type. State high school graduation requirements can be misaligned in any of these areas. Later analysis in this report deals with subject and course type alignment. 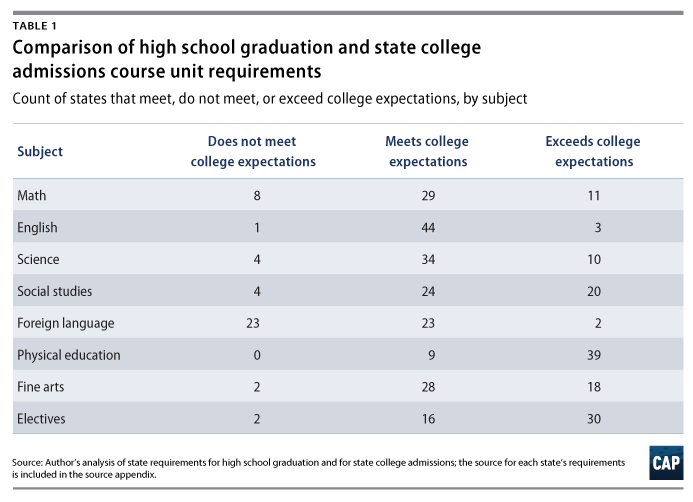 Table 2 shows that four states fail to meet college expectations in the years of study of high school social studies, while 24 meet those expectations and 20 exceed them. Those with less than college expectations in social studies are Delaware, Montana, New Hampshire, and Wisconsin. All of these states with the exception of New Hampshire require one year fewer for a high school diploma than is required for public university admission. New Hampshire requires one fewer semester. Most of the states meeting college expectations require three years of study; a handful require two, two and a half, or four years for both the high school and public university systems. Most of the states exceeding college expectations require one year more of social studies for a high school diploma than is required for public university admissions. A few states require one more semester. A few states—Alaska, the District of Columbia, and Puerto Rico—also require three more years than is required by the public university system. As noted earlier, these states do not include social studies in its college admissions criteria. Twenty-three states require less than college expectations in the number of years of foreign language study. Another 23 states require the same number of years of study in foreign language for both the high school diploma and college admissions. Almost all of the states not meeting college expectations do not require or make optional any study of foreign language to receive a high school diploma. The state public university systems in all but one state, Alabama, require two years of study in this subject. Two states—Puerto Rico and Washington, D.C—exceed these expectations since their public university systems set no specific coursework requirements. While states do not differentiate on the particular language of study for high school or college, colleges often require students to study the same language to get credit for this requirement. The extent to which states require study of the same foreign language will be assessed in the course type analysis section below. The following subjects—physical education, art, and electives—are overall required to a lesser degree for college admissions than for high school graduation compared with other subjects. As a result, most states exceed college expectations in these areas. No state requires less than expected for college admissions in years of study for physical education and health. Nine states require the same number of years of study to earn a high school diploma and meet the threshold for state public college admissions. For all of these nine states, the study of physical education is not required for the high school or public university systems. The remaining 39 states exceed college expectations in years of study required in physical education and health. This means that 48 states in total meet or exceed the number of years of study in physical education and health than is required for college admissions. About half of these states require from one semester to one year of physical education and health for both high school and public university systems. Seventeen states require one and a half to two years and two states—New Jersey and New York—require three years for both systems. Two states—California and South Carolina—do not meet college expectations for years of study of fine arts. Both require one year fewer of fine arts study for a high school diploma than is required for public university admissions. Twenty-eight states require the same number of years of study in this subject. All 28 states do not require or make optional the study of fine arts for both the high school and public university system. Eighteen states exceed college expectations in number of years of fine arts study. This is a sum total of 46 states meeting or exceeding college expectations in fine arts. Most of these states require one full year more of fine arts study in high school than is required for public university admissions. A handful require one semester or one and a half years more of fine arts study. Two states—Wisconsin and Wyoming—require less than college expectations in the number of years of study in electives. Their high school systems make no requirements for electives, but their public university systems require two years for admission. Sixteen states require the same number of years of study for high school graduation and college admissions. Most of these states require no electives for both the high school graduation and public university admissions systems. Two states, California and Wisconsin, have other course requirements for high school graduation that will likely fulfill their respective public university system admissions requirements for electives. Thirty states exceed college expectations in years of study of electives. A total of 46 states meet or exceed college expectations in years of study of electives. The difference in the amount of study varies most widely for electives, as high school systems require between one semester and four full years more of study of electives than their respective public university systems. Depending on course availability and the boundaries drawn by graduation requirements, students have discretion in the types of courses they take to fulfill high school graduation requirements. States may require all of the specific courses and sequences to be taken, for example, Algebra I, Geometry, and Algebra II—or their equivalents—where three years of math are required. Where four years are required, states may require only some of the specific courses, for example, Algebra I and Geometry, and allow students to choose among the options to fulfill two additional math course requirements. Or, states may simply require a number of years of study and make no course type specifications. Each of these scenarios are also true for college admissions. This portion of the analysis focuses on the extent to which there is a match in the course types and sequence required for high school graduation and state college admissions. This analysis compares the type of courses required in math, English, science, social studies, foreign language and “other” coursework required to receive a high school diploma against the courses required to be eligible for college admissions. The unit requirement analysis looks at 47 states, including the District of Columbia and Puerto Rico. The authors excluded five states from this analysis—Colorado, Maine, Massachusetts, Pennsylvania, and Vermont—because they require demonstration of mastery in lieu of specific course type requirements. The authors base course type solely on the name of the course. For example, Algebra I and Geometry are two different types of math courses. This analysis does not include course curriculum or other course completion requirements in determining course type. The authors organize findings into three categories: does not align, aligns, and could align with the right course sequence taken. Course types align when, in order to meet high school diploma requirements, students must take the same or more rigorous courses than are required for college admissions. For example, both high school and college systems might require completion of Algebra II in math, or both systems may require three years of study in math and be silent on the course types. Another obvious alignment occurs when high school courses are specified for diploma attainment and are not specified for college admission, but the years of study required for both are the same. All three scenarios would be an obvious match. Course types do not align when high schools require less rigorous courses for a diploma than is required for college admissions. For example, high schools might require completion of Geometry and college requires completion of Algebra II, which is a higher level of math. Course types could align when there is flexibility in either or both the high school or college course selections. For example, high schools and college may require students to take four total years of math courses, but high schools require up to Algebra I plus three additional courses and college requires up to Algebra II. Table 3 provides an overview of the types of courses required for math, English, science, social studies, foreign language, and other for 47 states. This analysis finds that high schools and colleges do not typically require specific course types in physical education and/or health, fine art, and elective subjects. As a result, this analysis aggregates these courses into a single group that the authors signify as other. Within each subject, the results are as follows for course type and sequence alignment between high school and state college organized by the following categories: does not align, aligns, and could align depending on student course choice. Across each category of comparison, there is the most alignment for the type of courses required for social studies. Forty-four of the 47 states included in the analysis require the same type of social studies courses for high school graduation as they do for college admissions, usually U.S. history, world history, and government or civics. Forty-four states also align in their coursework requirements for English between the high school and public university systems. In stark contrast is foreign language, where 22 states do not require two years of study in the same foreign language as required by their state colleges for admission. Finally, high school science requirements in 25 states could align with college expectations depending on student course-taking choice. Most usually, students must decide to take a laboratory science course—and almost always, biology, chemistry, and physics are laboratory science courses. But if schools lack the resources, schools may restrict these courses to being text-based or simply not offer them. Table 4 below provides more detailed results of the course type analysis by state and subject. High school math course types generally proceed along the following sequential order: Algebra I, Geometry, Algebra II/Trigonometry and Calculus, or Integrated Math I, Integrated Math II, and so on, for states adopting an integrated math instruction approach that combines concepts from different types of math into a single course. As depicted in Table 4, 23 states align in the course type and sequence required for high school mathematics and for college admissions in this subject. Aligned math course type generally includes completion of Algebra II or higher for high school graduation and college admissions. Eight states do not align between high school graduation and college admissions expectations in math. High school math coursework that is not aligned with college expectations can be one, two, or three full levels below. Indiana and Texas require one level below, while California and Maryland require two levels of math below. Missouri, Montana, Wisconsin, and Wyoming do not specify the math course types, so this counts as being three levels below, as per state requirements students could take any math courses in high school. Although, there may be district-level requirements students must meet. Sixteen states could align between high school graduation requirements and college admissions requirements in math, depending on student course-taking choices. Potential alignment of math course type involves student flexibility to choose one or more of their high school math courses, while the public university system requires specific math courses. For example, Georgia requires Algebra I, Geometry, and Algebra II and an additional course for high school graduation, while the state’s public university system requires these specified courses plus an additional higher-level math course. Georgia high school students could take statistical reasoning, and this would not meet the public university’s requirements. High school English curriculum is usually called English language arts or English composition for both the high school and college systems and includes a combination of reading and writing. This study finds that there is the least variation in the course type and sequence for this subject than any other. Forty-four states align in the courses required for English when comparing high school graduation and college eligibility requirements. Alignment means that all 44 states require English language arts or English composition I-IV for high school graduation and college admissions. Three states do not align in the courses required in English for high school graduation and for college admissions. These are California, Illinois, and Mississippi. California only requires English composition I-III; Illinois allows for English credit to be gained in other writing-intensive courses; and Mississippi only requires English composition I and II. This analysis considers the subject and lab component to determine alignment. Table 4 shows that 17 states align in the type of science study—both the subject and lab component—required to receive a high school diploma and to be eligible for college admissions. The following scenarios are all aligned because either the high school and public university systems do not require science course types; only the public university make no science course type specifications; or both systems make the same specifications in science subject, for example, biology, chemistry and/or physics or both specify laboratory science. Five states do not align in the type of science study—both the subject and lab component—required for a high school diploma and for college admissions. Lack of alignment occurs when high schools make no laboratory science requirements for graduation but public universities do. Twenty-five states could align if students take the right course sequence. This scenario occurs when states do not make high school science course type specifications for a diploma but these distinctions are made by their respective public university systems. In this instance, it is up to students to take the right course sequence to qualify for university admission. Social studies curricula in high school generally includes U.S. history, world history, government/civics and, less frequently, state history and economics. Forty-four states align in the type of social studies coursework required to fulfill high school graduation and college admissions requirements. Alignment in social studies course type occurs when both the high school and public university systems require the same sequence or type of social studies coursework, usually including U.S. history, world history, civics, and economics or geography. In addition, alignment occurs when colleges offer flexibility in the social studies course types that qualify for admissions. Table 4 shows that one state does not require the same type of social studies courses, specifically world history, for high school graduation as is required for college admissions. Two states could align if students take the right sequence of social studies courses in high school. In both cases the states do not specify social studies course types as do their respective public university systems. Both the high school and public university systems do not require study of a specific foreign language. However, according to this analysis, the study of a single foreign language is often required by public university systems. As shown in Table 4, 23 states align in the study of foreign language for high school graduation and college admissions. Alignment occurs when the study of foreign language is optional or not required for both the high school and public university systems. Or, both the high school and public university systems require two years of the same foreign language. Twenty-two states do not align in the study of foreign language for high school graduation and college admissions because their public universities require study of the same foreign language for admissions but this is not required by their respective high school systems. Two states could align if students take the same foreign language for two years, which is required by their respective public university systems. Course types classified as “other” include physical education and health, fine arts, CTE, electives, and other courses that do not fit these groups, such as financial literacy. 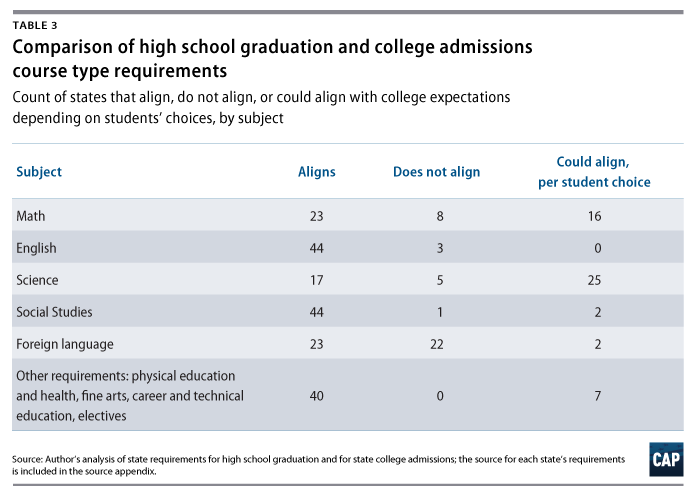 Table 4 shows that all but seven states align the requirements for high school graduation and their respective state public university systems for other course types. Since this match rate is so high and the course types vary so widely, this analysis will focus on the examples where course type does not align. Other course types do not align when public universities require additional college preparation courses, which may or may not be satisfied by a students’ choice in electives in high school. Additionally, public university systems require specific electives not required by their respective high school systems. This analysis makes a judgment of the quality of state high school graduation requirements based on an assessment of meeting five criteria: a 15-credit college-ready curriculum, a three-credit CTE curriculum in the same field, a well-rounded education, and alignment with state college requirements for course type and years of study. The fifth criteria is meeting two or more of these. Does any state require a minimum 15-credit college-ready curriculum? Does any state require three courses in the same CTE field? Does any state address a well-rounded education via life skills courses, financial literacy, online learning, business and communications, or civic engagement? Is any state completely aligned in high school graduation and college admissions expectations for the amount and type of coursework required? Finally, does any state meet all four of these criteria? This analysis provides a count of states meeting each criterion. In addition to measuring alignment of high school graduation requirements and college admission requirements, this analysis makes a judgment on the quality of the former using each of the criterion outlined above. What follows is a brief description of each criterion and the rationale for its inclusion in this analysis. Students who take three or more courses in the same CTE field are more likely to graduate than their peers and are more prepared to continue study in that field following high school graduation.27 Such students are also deemed “high-credentialed” by recent research because they achieve the same or higher life outcomes as college-goers.28 As a result, a significant policy advancement would be to require both the 15-credit college-ready coursework and three-credit CTE coursework for students pursuing career pathways after high school. This quality element counts how many states with completely aligned coursework requirements, in both the amount of study and course type. 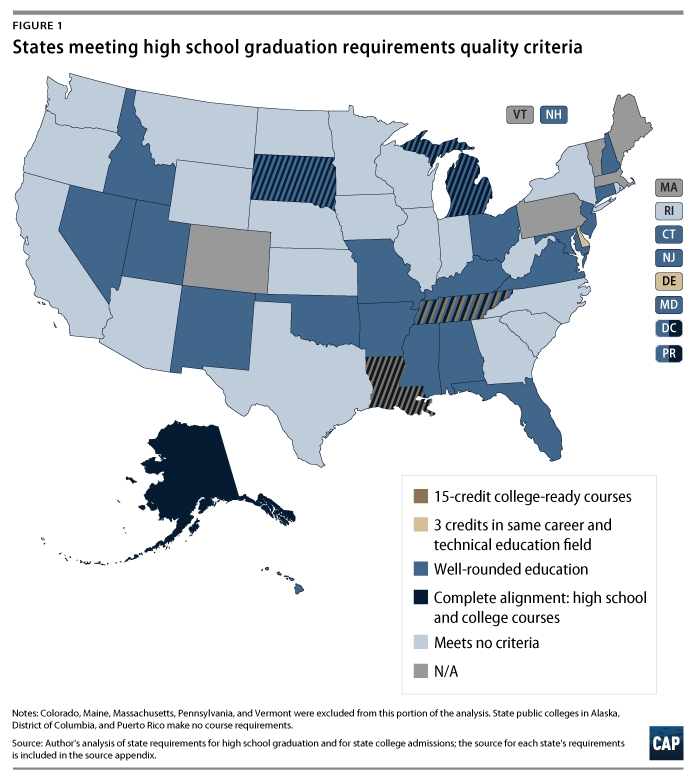 This count looks at how many states meet two or more of the four above-noted measures of quality for their high school graduation requirements. Overall, no state met all measures of quality. A small handful meet four of the five, as shown in the table below. Two states require a 15-credit college-ready curriculum: Louisiana—for its college-ready diploma pathway not its career-ready pathway diploma—and Tennessee. One state—Delaware—requires students to take three courses in a career pathway. Notably, Delaware also came close to meeting the 15-credit college-ready curriculum. It misses the mark within its science requirements because it does not require chemistry or physics. Four states—Alabama, Montana, Utah, and Washington state—require career preparation courses or CTE, but fewer than three courses. More often, states indicate that CTE coursework is optional, including California, Georgia, Hawaii, Illinois, Maryland, North Dakota, Oregon, South Dakota, and Virginia. Since none of these states meet the three-credit CTE in the same field threshold, they are not represented in Figure 1. Twenty-three states require some element of a well-rounded education. This can be coursework or other educational experiences, including life skills—sometimes called 21st-century skills, financial literacy, online learning, communications, business, community service, or the completion of a senior project. Four states—Louisiana, Michigan, South Dakota, and Tennessee—have aligned requirements to receive a high school diploma with admissions eligibility for the state public university system because they are aligned across math, English, science, social studies, fine arts, physical education and/or health, foreign language, and electives. Three additional states are also aligned—Alaska, Puerto Rico, and Washington, D.C.—but only because their respective public university systems do not make specific coursework requirements; these states are aligned by default. When considering all of these criteria together, no state meets them comprehensively for their basic diploma, although it should be noted that they some do try to approach this alignment with honors diplomas or recommended requirements, such as Massachusetts. Massachusetts’ recommended course of study is aligned to its public university system, but because its official basic diploma requirements only include proficiency demonstrations via assessments and coursework in social studies, its basic diploma is not aligned. Figure 1 shows which states meet two or more of these criteria. One area of focus that this analysis does not address is the idea of different graduation pathways. The Alliance for Excellent Education recently completed a report looking at graduation rates by diploma pathways and the disparities are stark.34 Far fewer students of color and low-income students graduate with the most rigorous diploma option. The extent of this issue on a national scale is unknown, as states are not required to publish graduation rate data disaggregated by subgroup and by diploma pathway. It is worth noting that Delaware and Louisiana, given their policies in career pathways, could be the first states to meet all of the quality criteria. However, broadly speaking and despite state rhetoric on the importance of addressing readiness for college, careers, and beyond, state policies fail to meet this ideal overall. This analysis reveals significant policy gaps for state high school graduation requirements when compared with state college admissions requirements and a series of benchmarks of readiness for college, career, and life. Ensure clear alignment of the requirements for high school graduation with the admissions requirements for state public university system. This will require the collaboration and coordination of the high school and state college systems in the areas of course type, amount, and curricula. One subject area that needs careful consideration is science, since misalignment can occur because public universities require laboratory science and providing this type of science may be particularly challenging for under-resourced school districts. Require completion of the 15-credit college-ready coursework required by most public university systems to receive a standard high school diploma. Research shows that noncollege-goers have better life outcomes if they take a rigorous high school course load regardless of college enrollment.35 This includes all of the following courses, or demonstrations of mastery of their equivalents: three years of math up to Algebra II; four years of English composition; three years each of social studies and science, including biology, chemistry, physics, with laboratory experience; and two years of the same foreign language.36 Any advanced or honors diplomas offered by states should exceed these expectations and could align with requirements for math and science college majors. Offer an additional career-readiness diploma for students that choose not to attend a four-year university. This diploma should require at least three CTE courses in the same field in addition to the 15-credit college-ready coursework. States should make these courses available to all students and ensure that they are in in-demand fields within the local labor market that lead to a well-paying job. Publish the graduation rates disaggregated by student group and diploma type, for example, the race, ethnicity, income, and disability status of students who received a standard high school diploma and other diploma options. Also, states report the disaggregated postsecondary outcomes for each diploma type, including course-taking patterns, credit accumulation, and college graduation rates. Ensure that all districts have the resources and educator workforce to offer the courses and preparation needed for students to meet the requirements for both standard and career readiness-diplomas, especially in math, science, and foreign language. This could include using technology solutions to enhance course access for students. Develop and maintain systems to monitor districts on appropriate methods to collect and analyze graduation requirement completion. Such systems would help to ensure the integrity and accuracy of the data. By addressing these gaps, students will be assured that their high school diploma denotes eligibility for their postsecondary pathway of choice, such as admission to a state college institution or further study in a CTE field. The concepts of college, career, and life readiness receive significant attention in public policy discourse. What these actually mean in practice—especially when it comes to what high school students must study in order to receive a diploma—has been a mystery, until now. Unfortunately, this analysis finds significant misalignment between the high school and college systems. What is required to receive a high school diploma is often not aligned with what students must study to be eligible for college admissions. This can be a matter of equity when more rigorous coursework such as advanced math, laboratory science, and foreign language courses are not offered on the high school campus, thus requiring college-bound students to seek this coursework elsewhere. Certainly, state high school graduation requirements are only a start to ensuring students are ready for college, career, and life. Many states allow or even require school districts to set additional requirements. However, not setting a minimum floor that at the very least meets state college admissions requirements puts students in districts with less rigorous requirements at a disadvantage, setting up inequities within states in access to college preparatory and career-readiness experiences. If states are serious about college, career, and life readiness, then they ought to review and modify their high school graduation requirements to ensure that they meet the benchmarks set forth in this analysis. When high school diplomas reflect rigorous requirements and actual mastery of those requirements, they will truly be a valuable credential that provides graduates with the options to enroll in college or start a rewarding career. Laura Jimenez is the director of Standards and Accountability at the Center for American Progress. Scott Sargrad is the managing director of the K-12 Education Policy team at the Center. The authors would like to thank the following individuals for their assistance in compiling and reviewing data and for their support in providing feedback: Rhea Handa, Jim Hull, Ryan Reyna, Caroline Scown, Sarah Shapiro, and Claire Voorhees. The sources listed below provided the information for state high school graduation and state public university admissions requirements. Alabama State Department of Education, “2017 AL High School Graduation Requirements” (2018), available at https://www.alsde.edu/sec/sct/Pages/graduationinformation-all.aspx. University of Alabama, “Admission Requirements for Freshman Students,” available at https://gobama.ua.edu/steps/freshman-req/ (last accessed February 2018). The Alaska State Legislature, “Alaska Administrative Code 4AAC 06.075,” available at http://www.akleg.gov/basis/aac.asp#4.06.075 (last accessed December 2017). University of Alaska Anchorage, “Admissions, Apply,” available at https://www.uaa.alaska.edu/admissions/how-to-apply.cshtml (last accessed February 2018). Arizona Department of Education, “ADE Information: High School Graduation,” available at http://www.azed.gov/adeinfo/hsgrad/ (last accessed December 2017). Arizona Board of Regents, “Arizona Policy 2-121, “Undergraduate Admission” (2017), available at https://public.azregents.edu/Policy%20Manual/2-121%20Undergraduate%20Admission.pdf. Arkansas School Boards Association, “4.45.1 Smart Core Curriculum and Graduation Requirements – Class of 2018 and Thereafter” (2016), available at http://www.vbsd.us/assets/uploads/2016/02/20160229130718-4451-smart-core-curriculum-and-grad-requirements-class-of-2018-and-thereafterpdf.pdf. University of Arkansas, “Undergraduate Admissions: Minimum Admission Requirements,” available at http://admissions.uark.edu/apply/prepcore.php (last accessed February 2018). California Department of Education, “Graduation Requirements: Courses required for graduation and university admission” (2017), available at http://www.cde.ca.gov/ci/gs/hs/hsgrtable.asp. Colorado Department of Education, “Developing Colorado’s High School Graduation Requirements,” available at https://www.cde.state.co.us/postsecondary/graduationguidelines (last accessed March 2018). University of Colorado Boulder, “CU University Catalog 2016-17,” available at https://catalog-archive.colorado.edu/2016-17/node/2210.html (last accessed March 2018). State of Connecticut, “Substitute Senate Bill No. 1059: Public Act No. 15-237” (2015), available at https://www.cga.ct.gov/2015/act/pa/2015PA-00237-R00SB-01059-PA.htm. University of Connecticut, “Undergraduate Admissions: Admission Requirements,” available at http://admissions.uconn.edu/apply/freshman/requirements (last accessed February 2018). State of Delaware, “Curriculum and Instruction: 505 High School Requirements and Diplomas” (2014), available at http://regulations.delaware.gov/AdminCode/title14/500/505.shtml#TopOfPage. University of Delaware, “Admissions Requirements: Applying to UD, Academic Requirements and Recommendations,” available at http://www.udel.edu/apply/undergraduate-admissions/first-year-students/admissions-requirements/ (last accessed February 2018). District of Columbia, “District of Columbia Municipal Regulations: 2203 – Academic Requirements” (2016), available at https://osse.dc.gov/sites/default/files/dc/sites/osse/page_content/attachments/2203%20Academic%20Requirements.pdf. University of the District of Columbia, “Admission Standards,” available at https://www.udc.edu/admissions/admissions-standards/ (last accessed February 2018). The Florida Legislature, “The 2017 Florida Statutes, Title 48, Chapter 1003” (2017), available at http://www.leg.state.fl.us/Statutes/index.cfm?App_mode=Display_Statute&Search_String=&URL=1000-1099/1003/Sections/1003.4282.html. Florida Board of Governors, “6.002 Admission of Undergraduate First-Time-in-College, Degree-Seeking Freshmen”, available at http://www.flbog.edu/documents_regulations/regulations/6.002Final_FTICAdmissions.pdf (last accessed February 2018). Georgia Department of Education, “160-4-2.48 High School Graduation Requirements for Students Enrolling in the Ninth Grade for the First Time in the 2008-09 School Year and Subsequent Years” (2011), available at http://www.gadoe.org/External-Affairs-and-Policy/State-Board-of-Education/SBOE%20Rules/160-4-2-.48.pdf; Additional state high school graduation information provided to the authors by the Georgia Department of Education, December 8, 2017. Board of Regents of the University System of Georgia, “USG Freshman Admission Requirements, Staying on Course: Required High School Curriculum” (2018), available at http://www.usg.edu/assets/student_affairs/documents/Staying_on_Course.pdf. Hawaii State Department of Education, “Graduation Requirements,” available at http://www.hawaiipublicschools.org/TeachingAndLearning/StudentLearning/GraduationRequirements/Pages/Requirements.aspx (last accessed February 2018). University of Hawaii at Manoa, “Freshman Admission Requirements: High School Course Requirements” (2016), available at http://manoa.hawaii.edu/admissions/freshman.html. State high school graduation information provided to the authors by the Idaho Department of Education, December 12, 2017. University of Idaho, “Admissions: Academic Core Requirements” (2017), available at http://www.uidaho.edu/admissions/Apply/first-year/admission-requirements/core-requirements. Illinois State Board of Education, “Illinois State Board of Education: State Graduation Requirements (105 ILCS 5/27-22, 27-22.05, 27-22.10)” (2016), available at https://www.isbe.net/Documents/grad_require.pdf. Illinois State University, “Admissions, Applying to Illinois State: Freshman Admission Requirements” (2018), available at https://illinoisstate.edu/admissions/freshman-requirements/. Indiana Department of Education, “Indiana’s Diploma Requirements, 2012-2013 Core 40, AHDE, THD (Class of 2016 and Beyond)” (2017), available at https://www.doe.in.gov/ccr/indianas-diploma-requirements. Indiana University Bloomington, “Office of Admissions, Everything You Need to Know (and Do) Before Beginning Your Application” (2018), available at https://admissions.indiana.edu/apply/freshman/step-one.html. Iowa Administrative Code, “281-12.5 (256) Education program” available at https://www.legis.iowa.gov/docs/ACO/rule/281.12.5.pdf (last accessed February 2018). Iowa State University Office of Admissions, “Admissions Requirements: Minimum High School Course Requirements for Admission” (2018), available at http://www.admissions.iastate.edu/freshman/requirements.php. Kansas State Department of Education, “Kansas Graduation Requirements 2017-2018 Fact Sheet” (2016), available at http://www.ksde.org/Portals/0/TLA/Graduation%20and%20School%20Choice/Graduation%20and%20Dropout/Kansas%20Graduation%20Requirements%20Fact%20Sheet%202017-2018.pdf. Kansas Board of Regents, “Qualified Admissions for Graduates Academic Year 2015-2016 and After” (2018), available at http://www.kansasregents.org/qualified_admissions. Kentucky Department of Education, “Minimum High School Graduation Requirements” (2018), available at https://education.ky.gov/curriculum/hsgradreq/Pages/default.aspx; state high school graduation information provided to the authors by the Kentucky Department of Education, December 8, 2017. University of Kentucky, “Undergraduate Admission” (2012-2013), available at http://www.uky.edu/registrar/bulletinCurrent/uga.pdf. Louisiana Department of Education, “TOPS University (College Diploma) Course Requirements for Incoming Freshmen Beginning Fall 2014” (2017), available at http://www.louisianabelieves.com/docs/default-source/jumpstart/course-substitutions.pdf?sfvrsn=23. Louisiana State University, “Undergraduate Admissions: Freshmen Admission Requirements” (2018), available at https://sites01.lsu.edu/wp/admissions/become-a-tiger-2/freshmen/freshman-admission-requirements/. Maine Legislature, “Maine Revised Statutes: Title 20-A: Education, Part 3: Elementary and Secondary Education, Subchapter 207-A: Instruction, Subchapter 3: Secondary Schools” available at http://www.mainelegislature.org/legis/statutes/20-a/title20-asec4722-a.html (last accessed March 2018). University of Maine, “Undergraduate Admissions: Application information,” available at https://go.umaine.edu/apply/applyinfo/ (last accessed March 2018). State high school graduation information provided to the authors by the Maryland Department of Education, December 13, 2017. University of Maryland, “Freshman Applicant Requirements,” available at https://www.admissions.umd.edu/apply/requirements/freshman (last accessed February 2018). State high school graduation information provided to the authors by the Massachusetts Department of Education, December 12, 2017. Michigan State Legislature, “The Revised School Code (Excerpt), Act 451 of 1976” (2018), available at http://www.legislature.mi.gov/(hzka3q2cfmj4r0vc4mdmp055)/documents/mcl/pdf/mcl-380-1278a.pdf?20151124150842. Michigan State University, “Office of Admissions, Freshmen Admission Standards,” available at https://admissions.msu.edu/apply/freshman/before-you-apply/admission-standards.aspx (last accessed February 2018). Minnesota Department of Education, “Graduation Requirements” (2017), available at http://education.state.mn.us/MDE/dse/gradreq/. Minnesota State University Mankato, “Undergraduate Admissions, Undergraduate Admissions Requirements” (2005-2018), available at https://mankato.mnsu.edu/future-students/admissions/undergraduate-admissions/admission-requirements/. Mississippi Department of Education, “Mississippi Diploma Options: Begins with Incoming Freshmen of 2018-2019,” available at http://www.mde.k12.ms.us/docs/secondary-education/grad-options-front-and-back_20171002.pdf?sfvrsn=2 (last accessed December 2017). Mississippi Public Universities, “Admissions Guide, Preparing for Success: College Preparatory Curriculum” (2018), available at http://www.ihl.state.ms.us/admissions/curriculum.asp. Missouri Department of Elementary and Secondary Education, “Graduation Requirements for Students in Missouri Public Schools” (2017), available at https://dese.mo.gov/sites/default/files/Graduation_Handbook.pdf. Missouri State University, “Freshman Admission, Admission Requirements” (2017), available at http://www.missouristate.edu/admissions/AdmissionRequirements.htm. State high school graduation information provided to the authors by the Montana Department of Education, December 8, 2017. University of Montana, “Admissions, Freshman Admission Requirements,” available at http://admissions.umt.edu/admissions/freshman/freshman-requirements.php (last accessed February 2018). State high school graduation information provided to the authors by the Nebraska Department of Education, December 8, 2017. University of Nebraska, Admissions Requirements: First-Year College Student” (2018), available at http://admissions.unl.edu/apply.aspx#admission-requirements/first-year. Nevada Department of Education, “NRS governing high school graduation requirements,” available at http://www.doe.nv.gov/uploadedFiles/ndedoenvgov/content/Boards_Commissions_Councils/High_School_Graduation/2017/February/NRSandNACgoverningHSGradreq.pdf (last accessed February 2018); Additional state high school graduation information provided to the authors by the Nevada Department of Education, December 12, 2017. University of Nevada, Reno, “Admissions, Freshman Requirements,” available at https://www.unr.edu/admissions/information-by-student-type/freshman-requirements (last accessed February 2018). New Hampshire Department of Education, “Technical Advisory #12: Competency Assessment of Student Mastery” (2006), available at https://www.education.nh.gov/standards/documents/advisory12.pdf. University of New Hampshire, “Undergraduate Admissions, How to Apply: First-Year” (2018), available at https://admissions.unh.edu/apply/first-year/. State of New Jersey: “N.J.A.C. 6a:8, Standards and Assessment Table of Contents,” available at http://www.state.nj.us/education/code/current/title6a/chap8.pdf (last accessed February 2018); State high school graduation information provided to the authors by the New Jersey Department of Education, December 13, 2017. Rutgers New Brunswick, “Undergraduate Admissions, High School Course Requirements, School of Arts and Sciences” (2018), available at https://admissions.newbrunswick.rutgers.edu/applying/high-school-course-requirements?_ga=2.170743972.521271809.1506371701-14845507.1506371701. New York State Education Department, “Diploma/Credential Requirements: Revised January 2018” (2018), available at http://www.p12.nysed.gov/ciai/gradreq/Documents/DiplomaandCredentialSummary1.18.pdf. Stony Brook University, “Undergraduate Admissions: What We Look for in a Freshman Applicant” (2018), available at http://www.stonybrook.edu/undergraduate-admissions/apply/freshman/. North Carolina Public Schools, “High School Graduation Requirements,” available at http://www.ncpublicschools.org/docs/curriculum/home/graduationrequirements.pdf (last accessed February 2018). University of North Carolina System, “Minimum Admission Requirements: Minimum Course Requirements” (2017), available at https://www.northcarolina.edu/prospective-students/minimum-admission-requirements. North Dakota Department of Public Instruction, “Current ND Graduation and Scholarship Worksheet” (2016), available at https://www.nd.gov/dpi/uploads/204/required.pdf. North Dakota State University, “Office of Admission, Freshman Admission Requirements” (2017), available at https://www.ndsu.edu/admission/admission_information/requirements/. Ohio Department of Education, “Ohio’s Graduation Requirements, Complete Courses and Requirements,” available at http://education.ohio.gov/Topics/Ohio-s-Graduation-Requirements/Courses-and-Requirements (last accessed February 2018). Ohio State University, “Undergraduate Admissions, Who Gets In?” (2018), available at http://undergrad.osu.edu/apply/freshmen-columbus/who-gets-in. Oklahoma State Department of Education, “Core Curriculum Graduation Requirements Class of 2022,” available at http://sde.ok.gov/sde/achieving-classroom-excellence-resources#hsgr (last accessed February 2018). Oklahoma State University, “Undergraduate Admissions, Admission Requirements – Freshmen Students” (2018), available at https://admissions.okstate.edu/information/freshmen/admission-requirements.html#freshmen. Oregon Department of Education, “Oregon Diploma, High School Graduation Requirements, Graduation in 2014 and Beyond,” available at http://www.oregon.gov/ode/students-and-family/OregonDiploma/Pages/Credit-Req.aspx (last accessed February 2018). Oregon State University, “Office of Admissions, Admission Requirements” (2018), available at http://admissions.oregonstate.edu/admission-requirements-0. Pennsylvania Legislature, “The Pennsylvania Code: Sec. 4.24, High school graduation requirements,” available at https://www.pacode.com/secure/data/022/chapter4/s4.24.html (last accessed March 2018). Penn State, “Undergraduate Admissions: High school course requirements, 4-year degrees,” available at http://admissions.psu.edu/apply/requirements/4year/ (last accessed March 2018). Puerto Rico Department of Education, “Serie A 800,” available at http://de.pr.gov/files/compendio/SERIE_A_800.pdf (last accessed February 2018). University of Puerto Rico at Mayaguez, “Admissions Requirements,” available at http://admisiones.uprm.edu/Admissions_Requirements_2015_USStudents.pdf (last accessed February 2018). Rhode Island Department of Education, “Council on Elementary and Secondary Education, Secondary School Regulations – Amendment” (2015), available at http://sos.ri.gov/documents/archives/regdocs/released/pdf/DESE/7925.pdf. University of Rhode Island, “Undergraduate Admission, First-Year Student Admission” (2018), available at https://web.uri.edu/admission/first-year-admission-requirements/. South Carolina Department of Education, “High School Courses and Requirements” (2018), available at https://ed.sc.gov/districts-schools/state-accountability/high-school-courses-and-requirements/. University of South Carolina, “Office of Undergraduate Admissions, Required High School Courses,” available at http://sc.edu/about/offices_and_divisions/undergraduate_admissions/requirements/for_freshmen/required_high_school_courses/index.php (last accessed February 2018). South Dakota Legislative Research Council, “South Dakota Legislature Legislative Research Council: 24:43:11:02 Specific Units of Credit Required for High School Graduation,” available at http://sdlegislature.gov/Rules/DisplayRule.aspx?Rule=24:43:11:02 (last accessed December 2017). University of South Dakota, “Freshman Admission Requirements” (2018), available at http://www.usd.edu/admissions/freshmen/apply-for-freshmen-admissions. Tennessee State Board of Education, “Tennessee Board of Education: High School Policy 2.103” (2016), available at https://www.tn.gov/content/dam/tn/stateboardofeducation/documents/meeting_oct_20_17/10-20-17_II_C_High_School_Policy_2_103_Attachment_Clean_Copy.pdf. University of Tennessee Knoxville, “Undergraduate Admissions,” available at https://admissions.utk.edu/high-school/ (last accessed February 2018). Texas Education Agency, “Chapter 74. Curriculum Requirements: Subchapter B. Graduation Requirements,” available at http://ritter.tea.state.tx.us/rules/tac/chapter074/ch074b.html (last accessed December 2017). Texas A&M University, “Office of Admissions, Freshman, High School Courses” (2018), available at http://admissions.tamu.edu/freshman/coursework. Utah Office of Administrative Rules, “Utah Administrative Code: Rule R277-705. Secondary School Completion and Diplomas” (2017), available at https://rules.utah.gov/publicat/code/r277/r277-705.htm. University of Utah, “Office of Admissions, High School Core Requirements” (2018), available at http://admissions.utah.edu/apply/undergraduate/high-school-core-requirements.php. Vermont Education Commission of the States, “Individual State Profile, Vermont,” available at http://ecs.force.com/mbdata/mbprofall?Rep=HS01 (last accessed February 2018). University of Vermont, “Undergraduate Admissions, First-Year Applicants” (2018), available at http://www.uvm.edu/admissions/undergraduate/first_year_applicants. Virginia Department of Education, “Graduation Requirements, Standards Diploma: Minimum Course and Credit Requirements – Standards Credits: Effective with First-Time Ninth Graders in 2011-2012 and Beyond” (2018), available at http://www.doe.virginia.gov/instruction/graduation/standard.shtml. Virginia Tech, “Admissions, Undergraduate Admissions, Apply, Requirements” (2018), available at https://vt.edu/admissions/undergraduate/apply/requirements.html. Washington State Board of Education, “Class of 2019 Graduation Requirements,” available at http://sbe.wa.gov/GradRequirements/ClassOf2019.php (last accessed December 2017). University of Washington, “Office of Admissions, College Academic Distribution Requirements” (2018), available at http://admit.washington.edu/apply/freshman/policies/cadr/#mathematics. West Virginia Department of Education, “West Virginia High School Graduation Requirements,” available at http://wvde.state.wv.us/counselors/students/documents/WVHSGraduationRequires2011-12andbeyond.pdf (last accessed February 2018). West Virginia University, “Undergraduate Admissions, Information for High School Counselors” (2018), available at http://admissions.wvu.edu/information-for/high-school-counselors. State high school graduation information provided to the authors by the Wisconsin Department of Public Instruction, December 13, 2017. University of Wisconsin-Madison, “Office of Admissions and Recruitment – Applying” (2018), available at https://www.admissions.wisc.edu/apply/freshman/requirements.php. Wyoming State Legislature, “Wyoming Graduation Requirements, Chapter 31,” available at https://1ddlxtt2jowkvs672myo6z14-wpengine.netdna-ssl.com/wp-content/uploads/2016/12/Ch31Rules.pdf (last accessed February 2018). University of Wyoming, “First-Year Students, Admissions,” available at http://www.uwyo.edu/admissions/freshman/requirements.html (last accessed February 2018).